We awoke this morning to a farm wrapped in a blanket of fluffy snow. Gray tree limbs dressed in white highlights stood out against the darkened woods. Sounds were muffled as walked back to the chicken coop. The guineas are usually the first to drop from their roosts in the morning, making a daily pilgrimage to our porch railings to beg for breakfast. The turkeys trot close behind them. On the African plains they would be tall giraffes that follow a herd of zebras. Not so this morning. We caught the guineas still lounging up on the pole barn rafters while the turkeys milled below searching for scraps of cracked corn on the ground. What’s all this white stuff out here? My toes are cold. 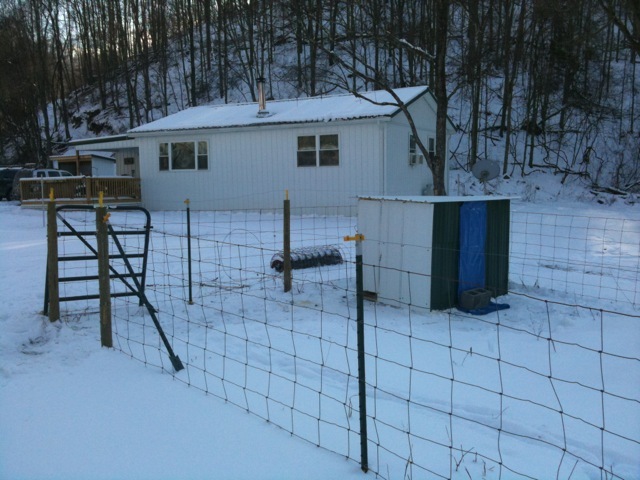 The bird netting on the twinny pennies coop yard was blotched in snow and the ground was covered. We shoveled out a path so they could get to their feed station. 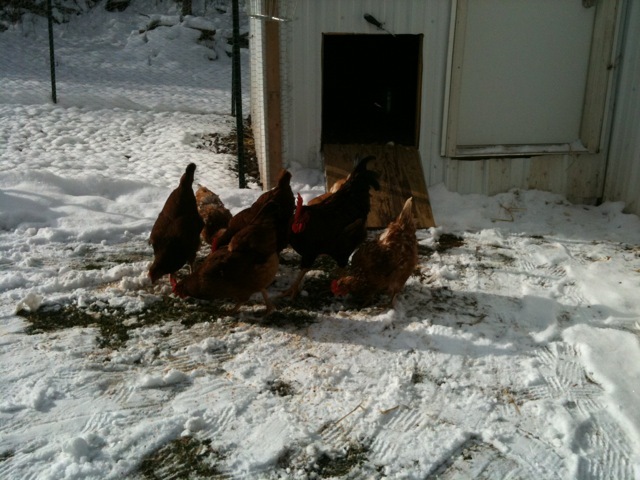 Of course we couldn’t leave out the chickens from the coop next door and shoveled a path for them as well to the feed station in the pole barn. Its a day to stay under cover and watch the snowflakes fall. None of the fowl will venture far from their shelters this day, the barn cats are snug in their beds, and Ruby is stretched out by the wood stove. All is quiet…peaceful. Shhhhh. The farm is at rest….for now. Bill Guinazzo has proven himself to be an expert in the art of road grading. 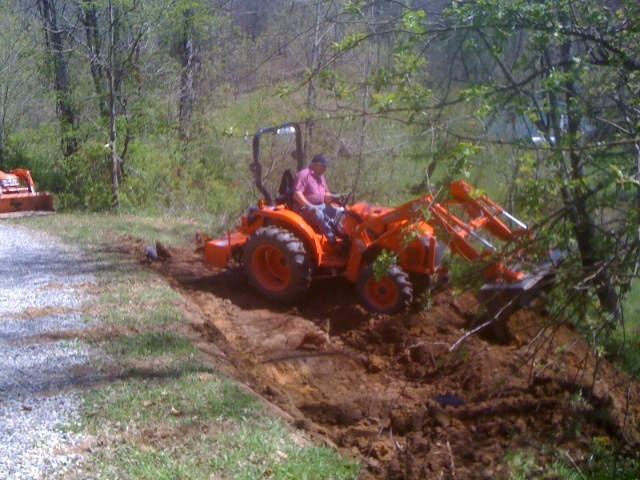 We noticed the nice job he did on making an access road on his own property and asked if he would do the same for us. We didn’t have access to one of the pastures that connects up to the neighbors hay field other than crossing the creek and its too difficult to get the tractor across it. Of course no one lives there and the only time you see anyone there is during the hay season. We have permission to cross the field only after the hay has been cut so that we don’t pack it down or destroy the grass. Lost bales of hay equals lost money. That limits our use of our adjoining pasture, so Bill cut in a road that leads off the main gravel road directly onto our property. Now Sonny will be able to keep the pasture bush hogged and we have the potential to fence it in for goats. The nice thing about living out here is that each one of us has skills that can help another, whether its construction, planting gardens, canning or making roads. There is all kinds of knowledge floating around these hills and all you have to do is ask for help. Its a code of neighborliness that was here long before any of us recent transplants showed up. Its a nice feeling to know you can count on one another. Speaking of that, John and Sonny are planning another project here at PHF. We are going to build a lean too addition onto the right side of the pole barn. Now that we have more farm equipment than will fit in the pole barn we had to expand. 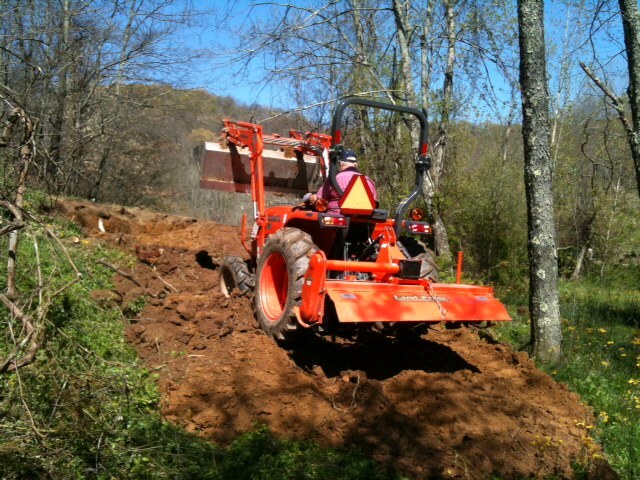 We can use the extra space to park the tractor or the Kobota RTV and the four wheeler. Sonny and I ran to town this morning to pick up the building supplies. Now, this afternoon John is going to taking us to see a guy who is selling his bee keeping equipment. It doesn’t hurt to go see what he has to offer. Right now our bees seems to be doing just fine, but we want to have another hive available for them to expand into. The other day Linda and I found a local farm that had Guineas for sale. After several emails and phone calls we headed just north or our place to find Two Lynns Farm in Shirley, WV. There we met Sandi and Lynn Hopper. They had moved from the West Coast about 8 years ago and got their local Organic farm up and running. They gave us a tour of their place. Chickens, Ducks, Guineas, Cows (beef or milk) and even got a overview of their Maple Syrup processing. We talked for hours and quickly realized they were good down to earth people. 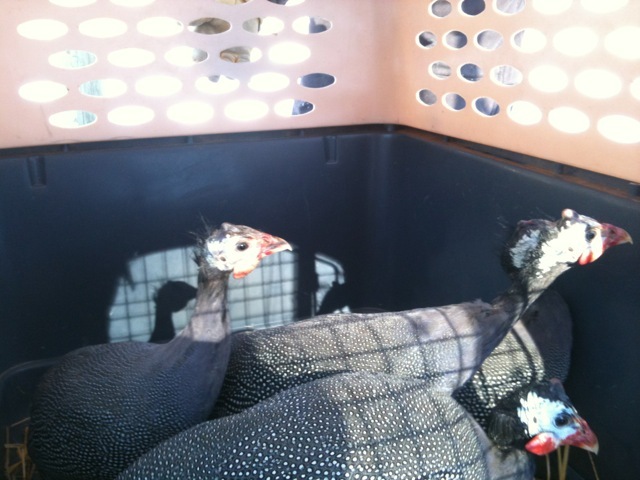 We picked up three guinea hens and one rooster. On the way home it dawned on us that we really didn’t have anywhere to put them. 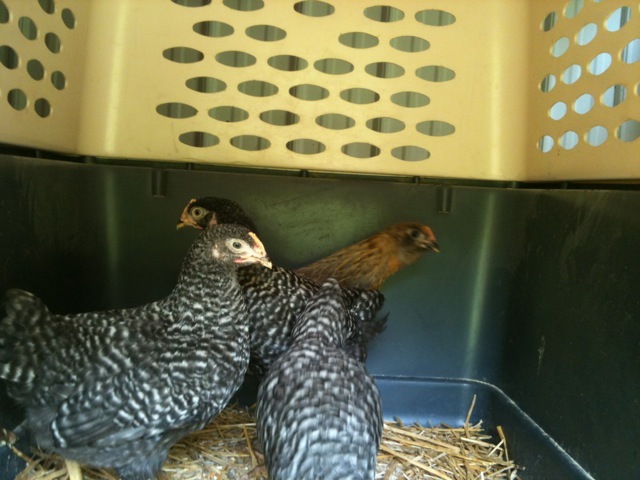 We could not put them in with the chickens because we needed to keep them locked up for a few days to help them figure out they had a new home. So we keep them in the dog cage (a big one) in the back of the Jeep overnight while we figured out what we were going to do. The next morning it was a cool 20 degrees but we decided to get started. We put on our winter gear and went to the barn to gather all the scrap metal, left over 2×4’s and a old pallet. After about 5 hours we got it completed. We decided to use a tarp for the door until we can got to Lowe’s for more supplies. We have had some sporadic sunshine today which lifted the spirits of all. Even though it was only about twenty degrees outside it felt warmer because the air was dry. It wasn’t that bone chilling cold you sometimes have to endure this time of year. 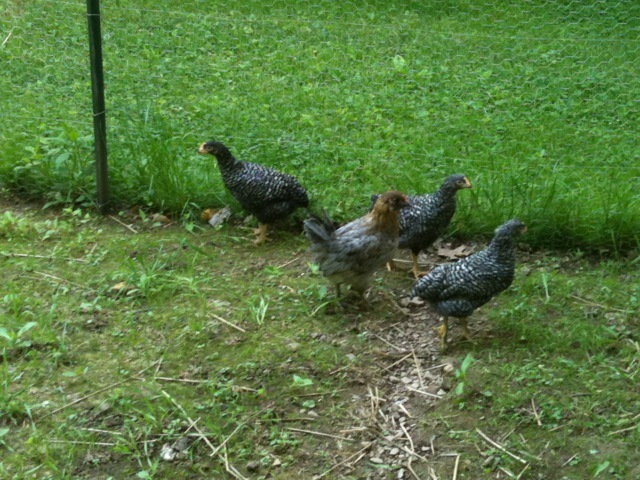 Since the sun was shining I thought the chickens might like a reprieve from the confines of the coop. The rooster this morning sounded like he was crowing, “let us out!” So, to appease my feathered friends I cleared a small section of snow in front of the coop hatch and put out some scratch. I’m sure they get bored in the coop. I must have pansy chickens, because they came out only long enough to eat the scratch and then quickly retreated back into the coop. Burrr! My tootsies are freezing! I left the hatch door open just in case they decided to step outside some more for a stretch and wing flap, but I don’t believe they did. I guess I will have to get them some chicken snow boots. I don’t hear the the chickens in Alaska crying. They go out in colder weather than this. On second thought maybe my chickens are geniuses. Why go out when its cold if the lady wearing the goofy Elmer Fudd hat is stupid enough to come out and take care of you. 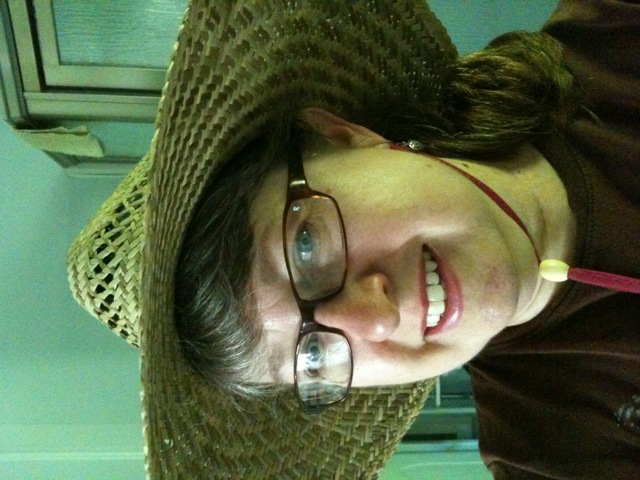 Fresh straw underfoot feels better than snow and that cooked oatmeal still warm from the pan….delicious. That warm water is great to drink too. Who needs a frozen beak. Yea, whose the pansy here and whose the sucker.